DODA, July 18: Rehmat Cricket Club (RCC) Jammu outplayed Youth Cricket Club (YCC) Ghat by 7 wickets in the ongoing All India 14th Gufran Memorial T20 Cricket Championship 2018, being played at Sports Stadium, here today. Excelsior Sports Correspondent DODA, July 18: Rehmat Cricket Club (RCC) Jammu outplayed Youth Cricket Club (YCC) Ghat by 7 wickets in the ongoing All India 14th Gufran Memorial T20 Cricket Championship 2018, being played at Sports Stadium, here today. Earlier, batting first after winning the toss, YCC Ghat scored a modest total of 103 runs in stipulated 20 overs, losing 6 wickets in the process. For RCC Jammu, Ankush Nagar scalped 3 wickets while Nabi, Nitin and Sandy shared 1 wicket each. In reply, RCC Jammu managed to reach the target in just 9.4 overs for the loss of 3 wickets, thus won the match by 7 wickets. 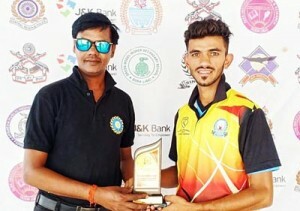 For his superb all-round performance, Sandy of Rehmat Cricket Club Jammu was adjudged as the man of the match who was given prize by Video Analyst from Uttar Pradesh, Ashok Sharma.